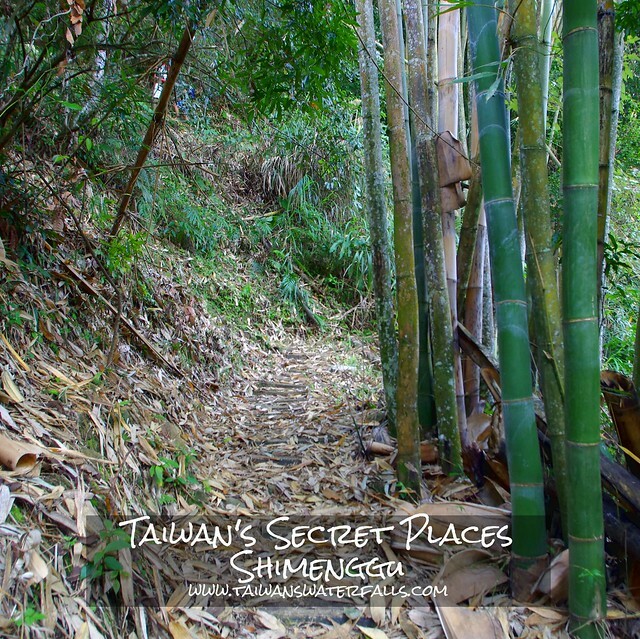 Shimenggu (Stone Dream Valley) is located in one of the most remote parts of Chaiyi County in Taiwan. 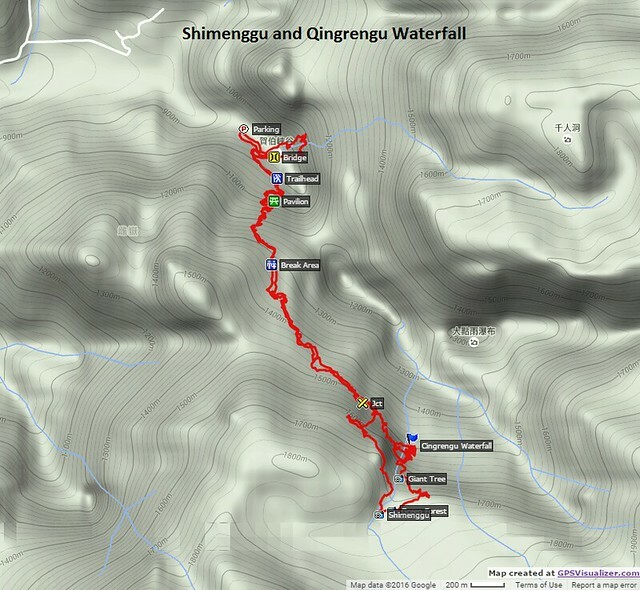 Shimenggu itself is a series of strange pools but the hiking trail is absolutely amazing with several different amazing sights. At the beginning of the trail there is a suspension bridge that links to an alternate entrance to Shuiyang Lake (blog) (and another Shuiyang blog) and some stands of enormous bamboo while walking up a valley of 500+ meter walls. 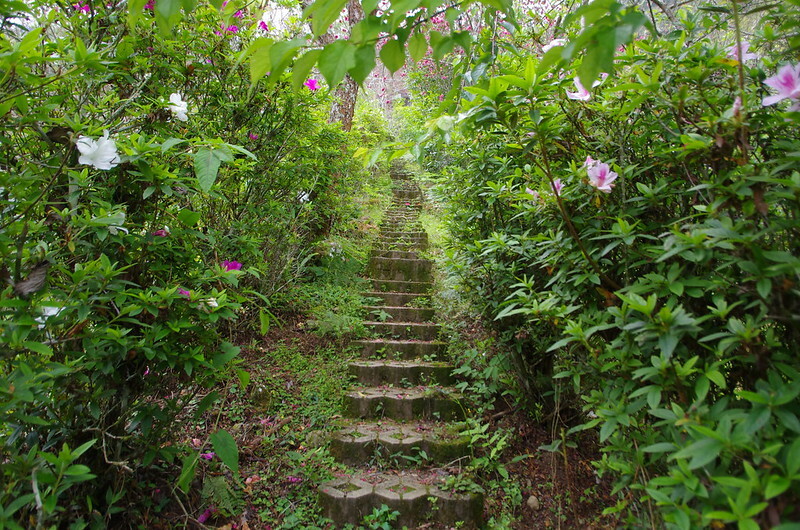 After a hard ascent (300 meters in 1+km) you reach the perfect mountain garden. This garden used to be the home to a nice elderly couple that we met in 2013 and they operated a part time B&B. Since then they have moved away but their garden is still perfect. The trail is nice before the garden but the best places are the furthest away. I had hiked part of the trail 3 years earlier with Richard Saunders (Richard’s blog from that trip) but I stopped at the garden to rest because I had a 5 hour motorcycle ride home that day. Richard and several other hikers came back gushing with how great it was. It took me 3 years to return but I finally found out how great the rest of the trail is. Near the end of the trail is a loop that we hiked the loop clockwise. The waterfall was much larger than expected and is one of my favorites in Taiwan. Just above the waterfall are some great pools for summer swimming. The hike becomes very steep after this going past a grove of ancient trees that remind me of Jianxibao. Sadly most of the trees have been illegally logged. 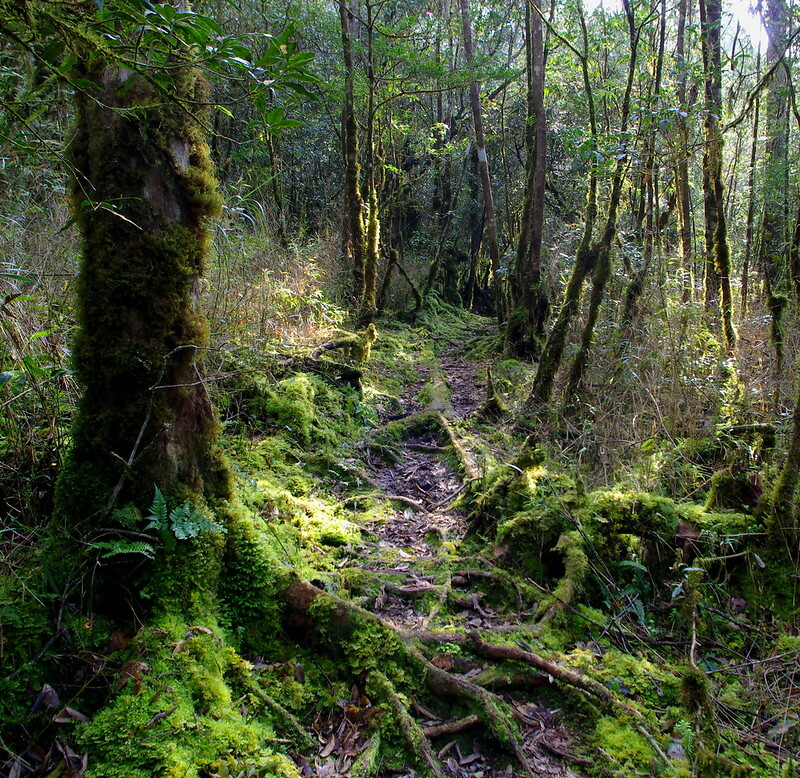 Immediately afterward it changes to a damp forest with green moss hanging from the trees like it was part of the Lord of the Ring set. Finally we arrived at Shimenggu. 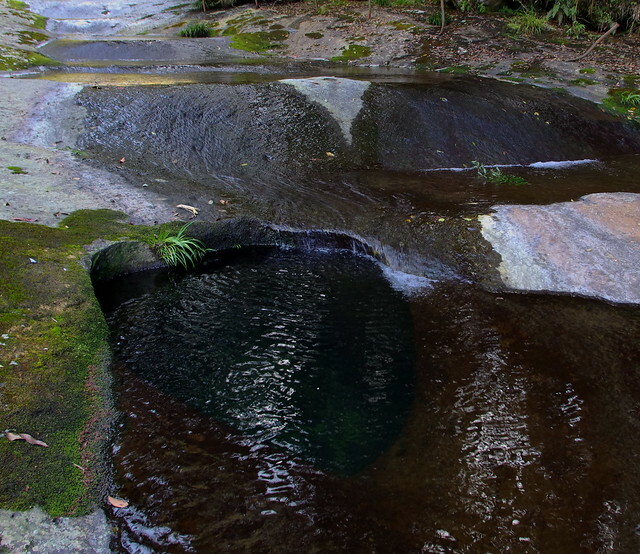 Shimenggu is a series of bizarre pools in a stream that runs down a large piece of rock. The hike is difficult but not impossible and it will take most of the day. Looking up the main valley from the suspension bridge. The suspension bridge leads to an alternate route to Shuiyang Lake. We have looked a couple of times and the route to Dadianyu Waterfall seems to be blocked by a giant boulder. 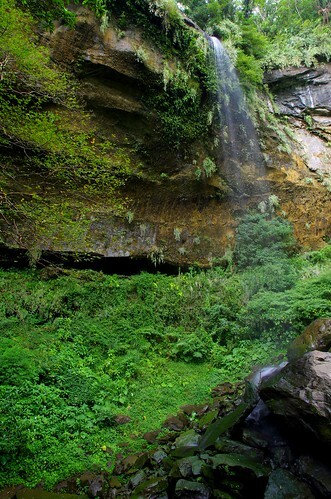 According to some hikers it takes 4 hours to reach 1000 person cave and an additional 2 hours to reach Shuiyang Lake. The trail was in much better shape on my 2016 trip though. In 2013 we couldn’t find anything that looked like a trail but now it seems to be in decent shape although it is a very steep climb out of the valley. The cables across the valley are for a small cable car that was used by the family to transport their personal items up the mountain. The path shown leads to the small waterfall. Instead the trail climbs 500 meters in 2 kms to the top of the cables. Huge bamboo flanks parts of the first half of the trail. 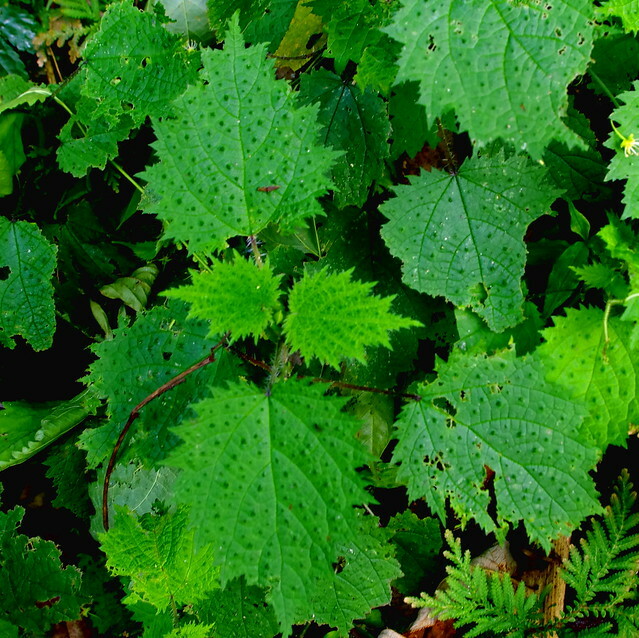 There is a fair amount of stinging nettles at the beginning of the trail and much more of it on the other side of the suspension bridge (a side trip and not the way to Shimenggu). It isn’t serious if you touch it but it is VERY annoying. The flower garden that was part of a beautiful home and part time B&B. We met the owners 3 years ago but they have since moved away (likely into the village). The garden is stunningly beautiful and you walk through a tunnel of rhododendrons, cherry blossoms and other flowers. This rather bizarre rock is right next to the trail. I have no idea what caused this. Qingrengu was just the first spectacular sight of many near the end of the hike. The cave behind it is accessible and actually had an old stone wall built in it. This one will definitely be on my favorite waterfall list whenever I publish it. 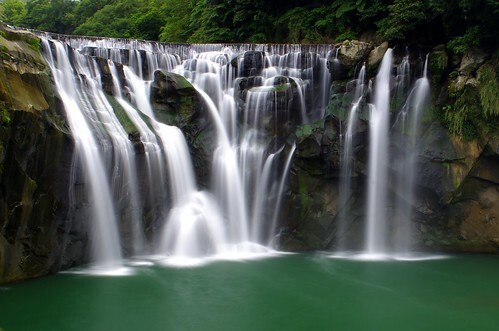 Directly above Qingrengu Waterfall are some perfect pools that would be awesome to swim in during the summer. It is at 1500 meters of elevation so it might not be warm enough to swim even in early spring or late fall. Asher (followxiaofei.com) stands directly on top of Qingrengu Waterfall. The trail goes vertical again climbing 200 meters in the next kilometer. This giant cypress tree is right next to the trail and is sadly one of the last ones in this area. There is access to an impressive valley here that I will explore next time. It looked like there was a nice waterfall and some vertical cliff walls. 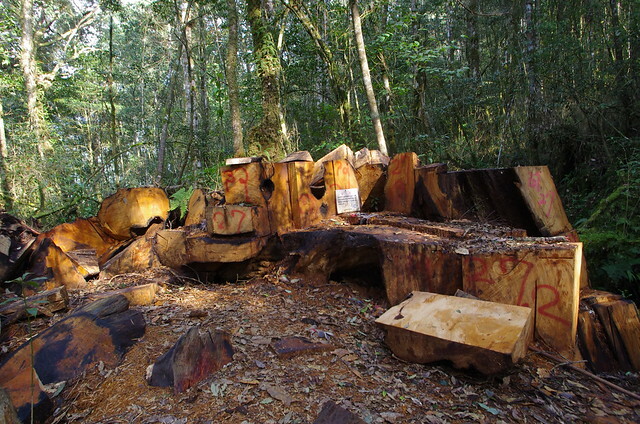 Illegal logging has taken its toll on the giant cypress trees. There were several recently logged trees and we only saw one giant cypress and several other much smaller ones. I cannot imagine how difficult it would be to carry the entire tree (chopped up) out by hand. And they would probably have to work at night. This is a fairly difficult hike with a daypack. 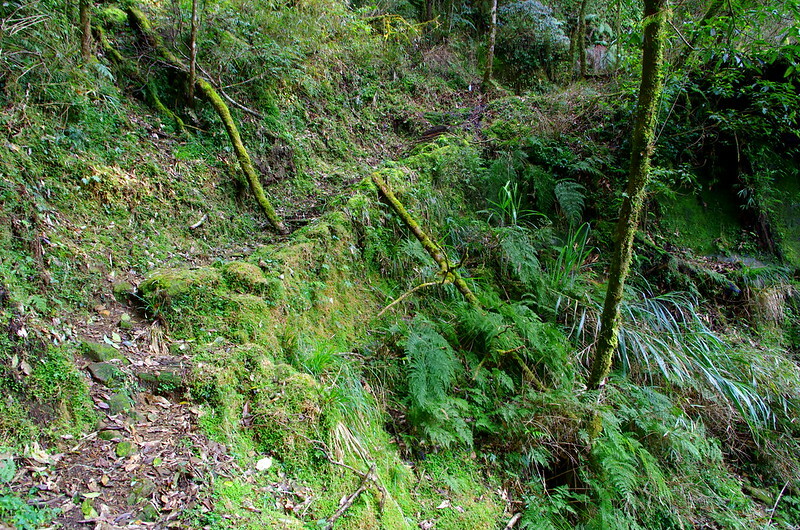 At the highest elevations the trail becomes a lush green paradise. One of the more creative parts of the trail. I am guessing that this type of construction is no longer allowed to preserve the larger trees in this forest. This part of the hike was probably my favorite. It occurs at the highest elevation on the trail (about 1700 meters) and almost the absolute farthest point of the trail. It is definitely worth it to hike the entire trail even though is over 800 meters of elevation gain to reach this spot. Shimenggu is a series of bizarre pools where the rock has worn away in deep pools that go straight down. This hole was well over 1 meter across and 2-3 meters deep. I think these would be good places to swim during the summer. We didn’t have time to walk upstream from the trail but there is potentially something really cool up there. The whole trail is nice but the best part is the loop at the end of the trail. The bridge near the trailhead provides access to 1000 person cave (marked in Chinese in the top right of the map). It must be an exhausting hike since there are A LOT OF contour lines that it crosses. Shuiyang Lake is 2 hours past the cave. 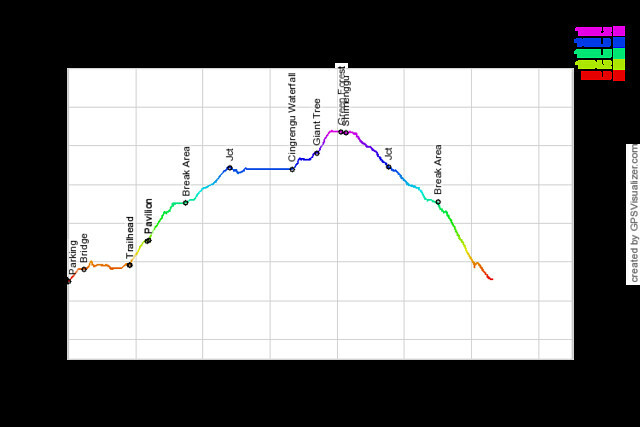 The isn’t quite as long as shown due to the off trail exploring across the bridge and the long breaks at the break area and the waterfall. Overall the trail is about 10 km long. During Chinese New Year I traveled to North Sumatra for my second trip to Indonesia. Last June I traveled to Bali but avoided the popular beaches along the southern coast and instead spent my time exploring small roads. In Bali I found 14 waterfalls, visited 10 temples and climbed a volcano and loved it. This time I picked something a little more off of the beaten path although rural Bali is not at all like the touristy parts. 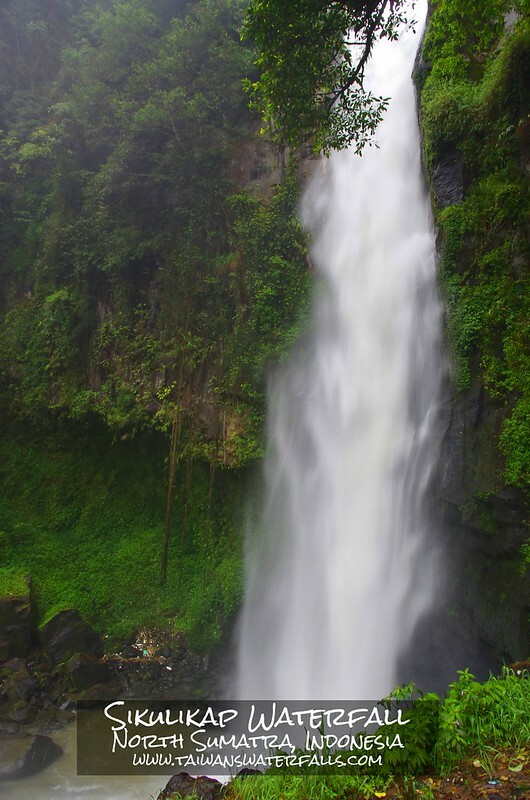 In Sumatra I only visited 6 waterfalls but they were some of the best ones in all of Indonesia. Sipisopiso Waterfall was of course the first thing that I knew about North Sumatra but as I researched the area I found a lot of other great waterfalls. I found travel logistics difficult and a lot of the roads are in terrible shape but North Sumatra is full of cool places (if you can get to them). The food was good, the people were really nice, I felt safe (didn’t stay in Medan) and the natural beauty was incredible. My biggest complaint is a complete and total lack of garbage/recycling programs. There were a few collection areas in Berastagi but throughout the countryside people either pitched their garbage in road ditches or burned it on the side of the road. A few of the top sights were well developed for tourism but many sights required a lot of effort from tourists to get to. I have many places on my to do list that either would have taken too long to get to or the roads were in questionable shape. This area has a lot of potential though and I look forward to returning in a few years. Here are a few basic travel observations for North Sumatra. Buses travel all over North Sumatra but are slow. Private cars and drivers are available for hire and can be arranged through your guesthouse. The driest season to travel to Sumatra is Dec to April but they still average 100+ mm’s of rain every month. It rained almost every day during my trip in February. Most guesthouses are private rooms with shared or private bathrooms. I saw a few large palm oil plantations in North Sumatra but I saw mostly vegetable and fruit farms. According to a local the big palm oil plantations are in the southern part of Sumatra. The National Parks have been a success but there are still problems with poaching and illegal logging but things seem to be improving. I am hoping to travel to Lombok (hike Mt Rinjani and some waterfalls) in May but I am not sure which Indonesian region to travel after that (in 2017). Yogyakarta and Borobudur? Mt Bromo and Madakaripura Waterfall? Flores and Kelimutu? Something strange like Sulawesi? I have a year to think about another destination but does anyone have any advice for a waterfall focused trip? 1. 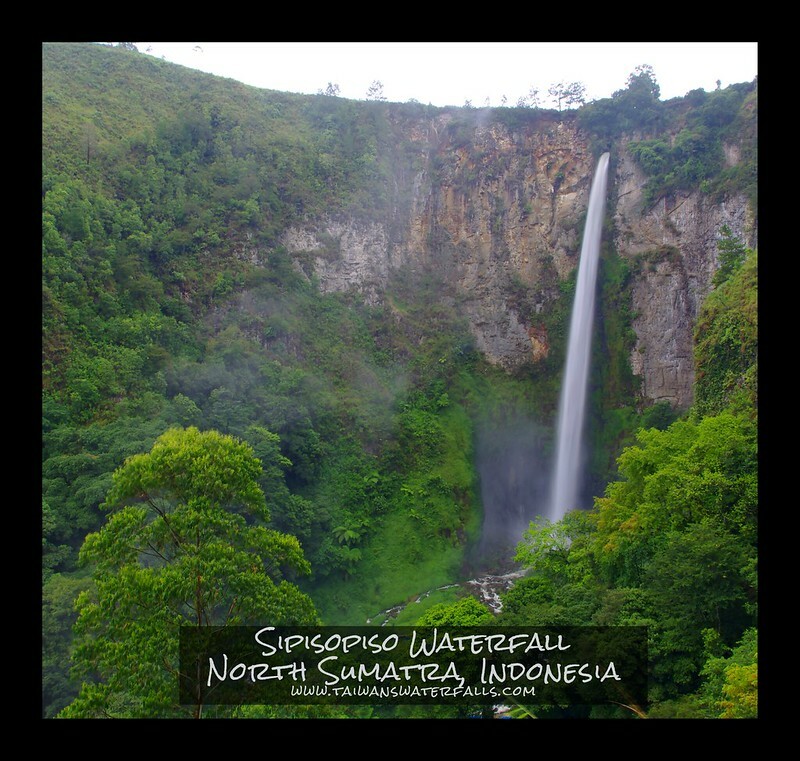 Sipisopiso Waterfall was at least 90% of the reason that I chose to travel to North Sumatra this year. Not only is it over 100 meters high but it flows out of a cave near the top of the cliff. From the main viewpoint visitors are able to turn around and also see Lake Toba. Those wanting to get closer to the waterfall can descend over 600 stairs to the base of the waterfall. Of course they will have to walk back up all of those stairs. 2. Pelaruga Waterfall was a nice waterfall but at some point a tree was washed downstream and ended up directly in the middle of the waterfall. 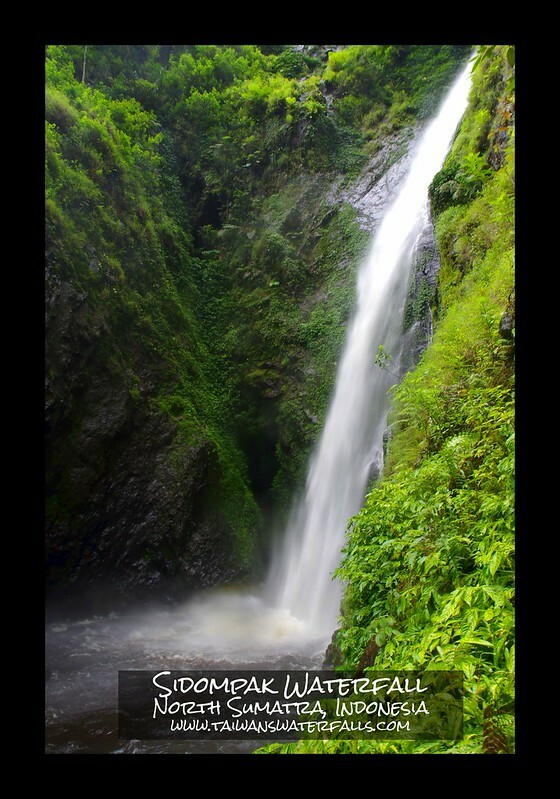 It has been there so long that it is more commonly referred to as Tongkat (Bahasa for stick) Waterfall by everyone. It is an adventure to reach but it is definitely worth it. 3. We found Sidompak Waterfall completely by accident. 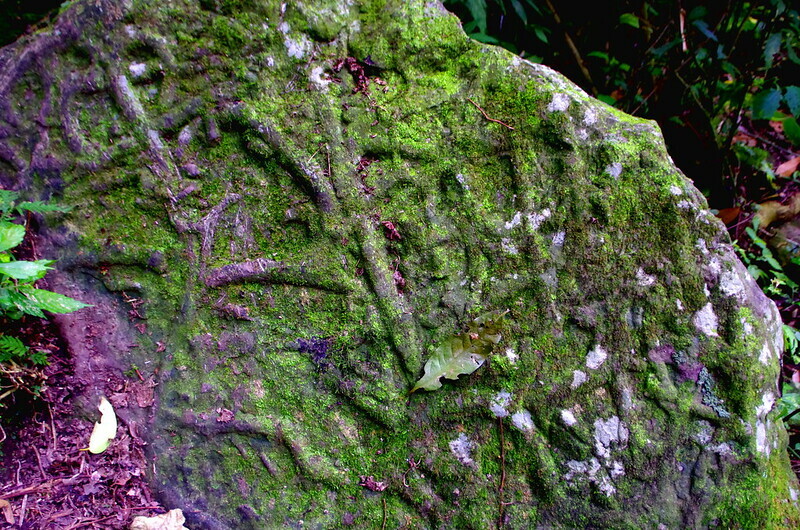 We knew virtually nothing about Tongging Village other than it was right next to Sipisopiso Waterfall and Lake Toba. 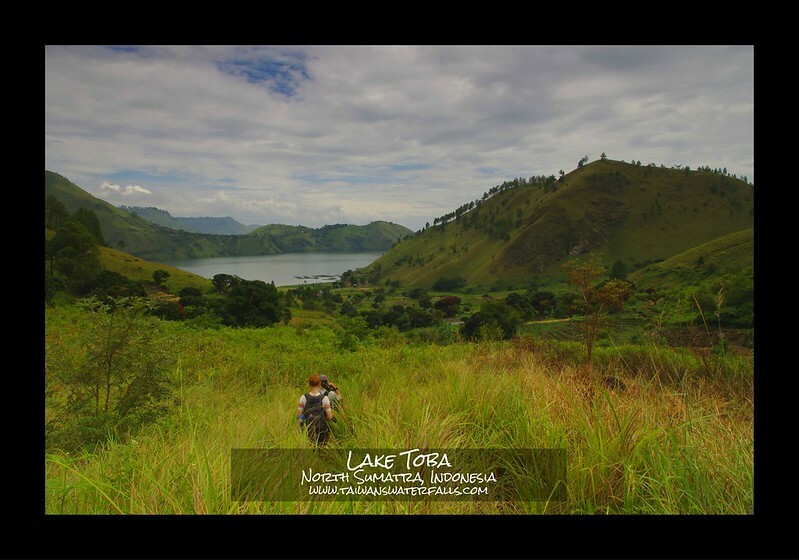 We found Tongging to be a stunningly beautiful village surrounded by fjord like valleys that taper off into Lake Toba. We called Tongging ‘A place that isn’t a place yet’ and expect this sleepy village to transform into a tourist town in the future. But we visited Tongging before that happened. Just by chance we stayed at the Wisma Sibayak Guesthouse and they had photos of a nearby waterfall on their wall and it wasn’t Sipisopiso Waterfall. We asked about it and not surprisingly they offered to find us a guide to the waterfall. We discussed whether or not we actually needed a local guide and we were extremely glad that we chose to hire one. There isn’t a trail and it is really challenging to make it to the waterfall even though you know where the waterfall is. I love finding places like this where there is nearly no information available on the internet in any language. 4. 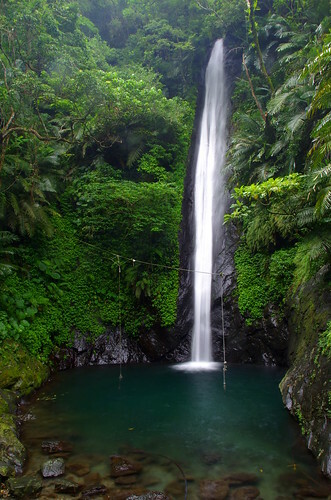 Sikulikap Waterfall is a thunderous waterfall near Berastagi. The best part is that it is really easy to reach using public transportation. The downside is that most of the hike follows the valley directly below the Penatapen Restaurants and it is difficult to escape the noise and trash from the restaurants. 5. 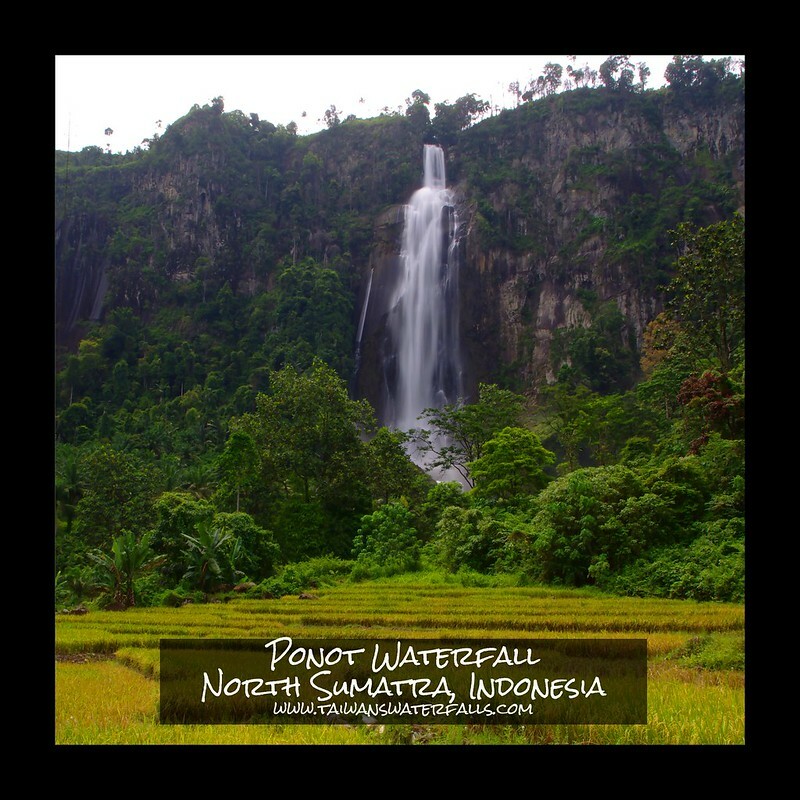 Ponot Waterfall is Indonesia’s tallest waterfall at 250 meters and it impressively plunges over a cliff wall. I am not completely convinced it is a natural waterfall though. I think Ponot Waterfall is actually a diversion tunnel for the upstream Siguragura Dam. Siguragura Waterfall is officially considered as Indonesia’s tallest waterfall but I believe that it is permanently dry just downstream of the dam. 6. 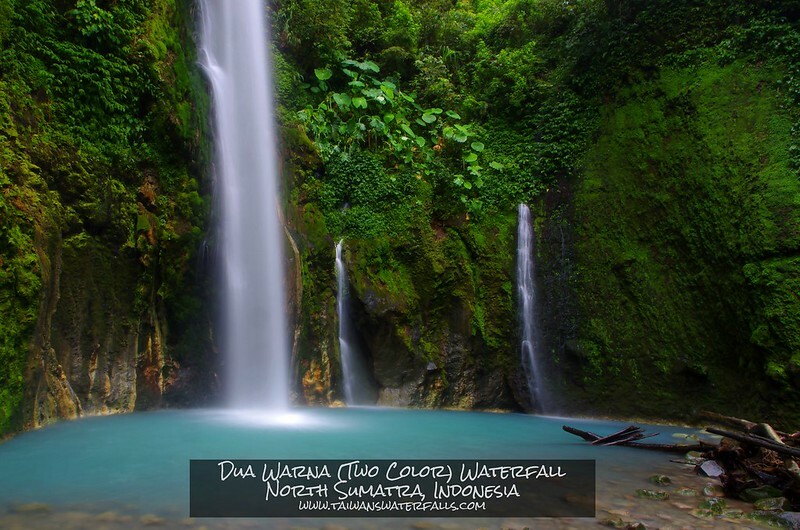 Dua Warna (Two Color) Waterfall is perhaps one of the most beautiful waterfalls that I have seen. It is only about 30-40 meters tall but it falls into a brilliant opaque blue pool that I haven’t seen before. Not only that but it is an outstanding hike through a beautiful forest and there is a second waterfall falling into the valley 30 meters away. 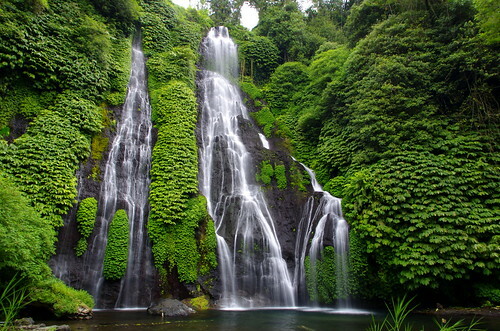 Other waterfalls that showed up in my research and are on my list for my next trip to North Sumatra. This page (in Bahasa) is a great resource for all of the sights in North Sumatra. After working in the guitar industry for a couple of decades in Los Angeles, Steve Tsai moved back to Taiwan and has entered the restaurant business with a trendy spot near Old Hanshin Mall. Steve merged his passion of guitars and has an entire wall built out of over 300 guitar bodies. In addition to that Steve’s musical background is obvious with the rest of memorabilia and the music. He is also set up for live music and check his Facebook page for any upcoming gigs at ZZyZx. The name ZZyZx is actually an interesting story and is tied back to Steve’s California roots. Here is a great version of the story. 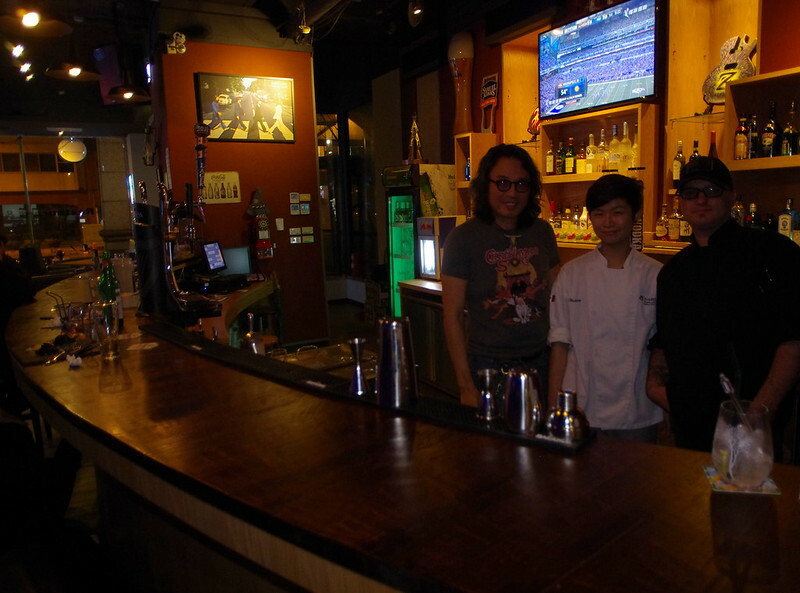 Steve opened ZZyZx in late November and recently brought Chris (formerly of The Eatery) in to set up the kitchen. Since closing The Eatery, Chris has been working for a high end kitchen supply company (www.jendeindustries.com). Chris gave me a tour of the kitchen and their setup is really impressive (although I know nothing about the restaurant business). 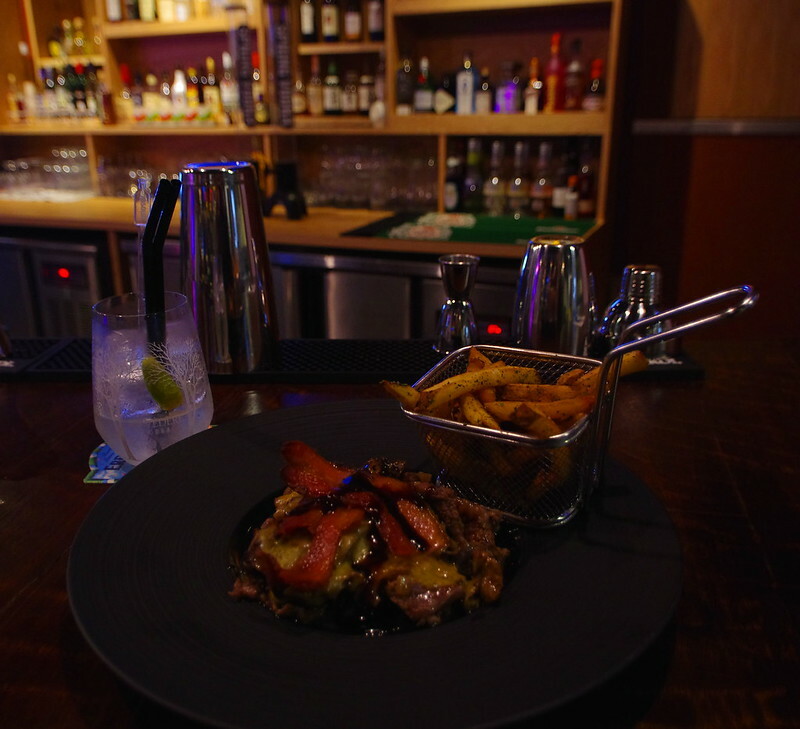 The menu consists of burgers, pasta and a few main dishes starting at 250 TWD and a large selection of drinks. This bunless burger was excellent. It wasn’t easy finding 10 different (and active) bloggers that have been to waterfalls in Taiwan that I haven’t been to. This isn’t my full to do list for this year but these are 10 more great ones that I hope to add to my waterfall guide. Some of these will be more of a challenge than others because of where they are located but this year I will be putting on a lot of kilometers in cars, motorcycles (bicycle? ), trains, buses and maybe even a plane ride (Hualien?). One thing that I discovered while researching this blog is just how many excellent bloggers are covering Taiwan. I follow a lot of bloggers in Taiwan (and everywhere) but there are still so many that haven’t shown up on my radar. This is by no means a comprehensive list of bloggers but I would love to know some of your favorites. I would really love to know of bloggers that have been to waterfalls that I haven’t been to yet. 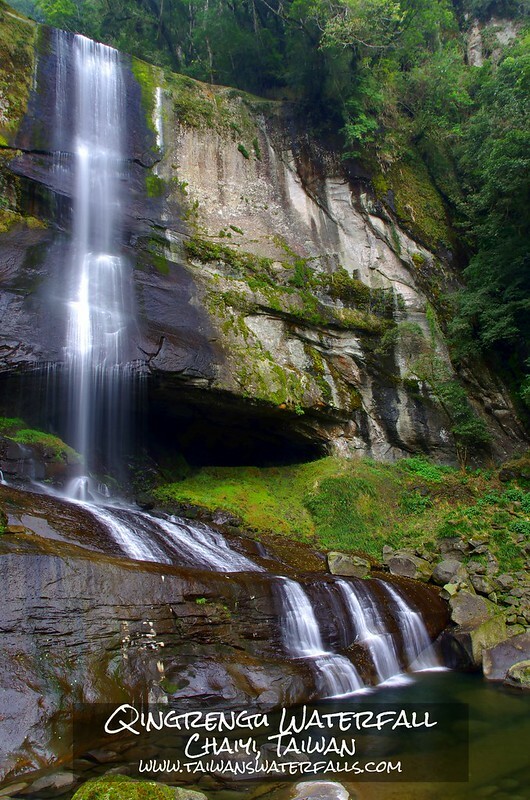 You can check my site for all of the waterfalls that I have been to and I will include a list of some additional notable ones at the bottom of this post. I am certain that there are some great bloggers that have been to waterfalls that I haven’t been to. None of the photos below are mine. I contacted each blogger prior to blogging for permission to use a photo and link to their blog. I encourage you to visit their sites to see more of their great work. 2. Emily has since left Taiwan and she is now blogging her adventures in Mexico. At the time I wasn’t aware of Fenghuang Waterfall in Chaiyi but it has been on my to do list for almost one year. 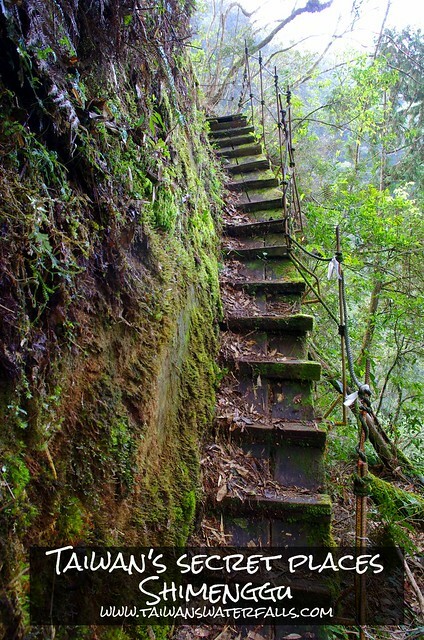 It has been nicknamed 1000 step waterfall due to the many stairs that need to be walked down. You can follow her travels at everythingisgolden.wordpress.com. 3. 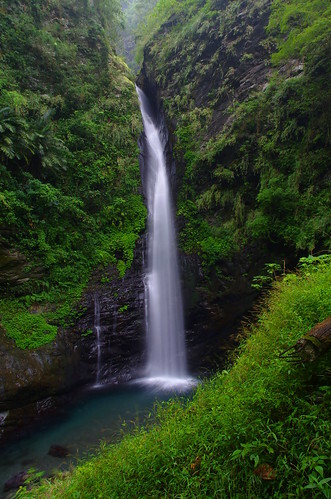 I loved my trip to Yilan last year (11/2014) and was able to add 5 great waterfalls to my site. 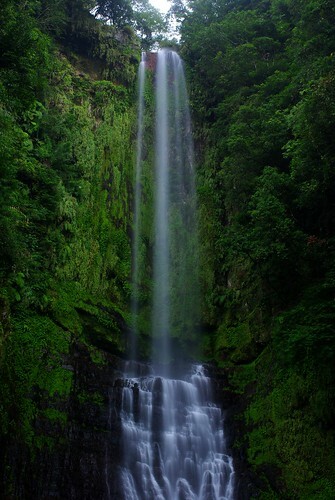 Houdongkeng Waterfall is another nice one that Thomas added to his blog. Yilan is a bit tricky to travel to from Kaohsiung but it is pretty amazing and I should figure out how to make another trip up there. You can follow his blog at randomibis.wordpress.com. 4. In all honesty very few serious hikers travel all the way to Wuling Farm just for Taoshan Waterfall. There just happens to be a really nice waterfall on one of the best high mountain hikes in Taiwan. The Wuling Sixiu is part of the Sheipa (Snow Mountain) National Park system and features 4 of Taiwan’s top 100 peaks. 7. Richard Saunders is in the midst of publishing his 7th book (2 out of print) on travel in Taiwan. One of his hobbies is finding hidden places and especially waterfalls. Golden Grotto (not exactly unknown) is one of the top river traces in Taiwan and has been on my to do list for a couple of years. Travel logistics (Kaohsiung to Hualien) have prevented me from making the trip but this year I will have Fridays off and it will be a lot easier. 10. Josh Ellis is one of the top photographer/bloggers that I follow. He covers a broad range of topics in Taiwan but his specialty is the cultural side of Taiwan imo. He does pretty well at waterfalls also though and has been many places that I haven’t yet. I recommend checking out his Best of 2015 blog post to see his full array of work. 2015 was a big year for content on my blogs because I went many places. 2015 was also the year that my waterfall guide started taking off. My blog became more popular also but the waterfall guide is becoming very well known. It is pretty common meeting people that know about and use my waterfall guide. Shown below are the top 11 most viewed waterfall guide pages. 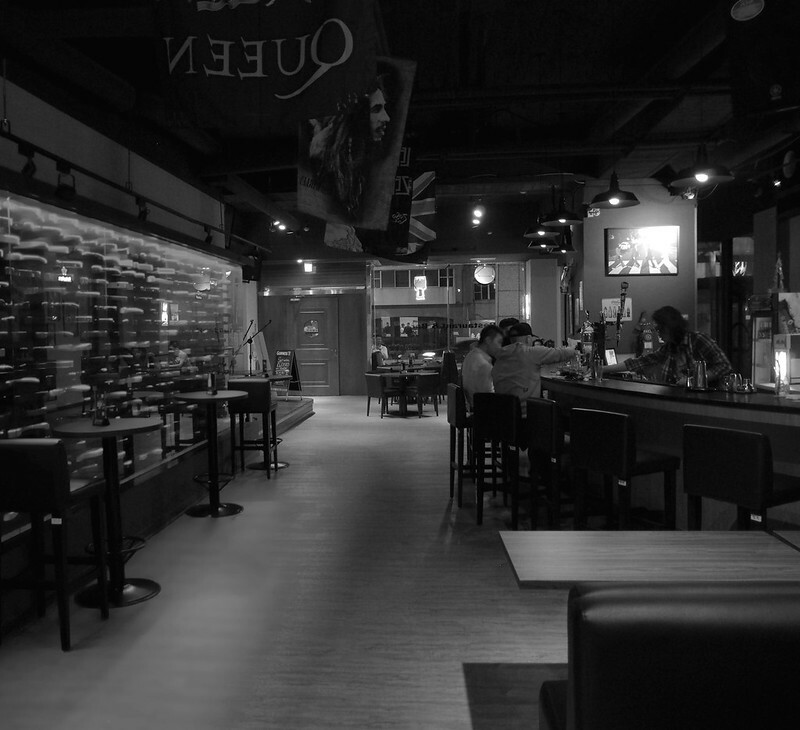 Some are my favorites while others are conveniently located near Taipei so they are often visited. The waterfall guide grew from 41,000 views to 69,000 views for a 68% increase last year. The World Is Not That Big was viewed another 17,000 times. That really isn’t the interesting part. It is more interesting to see what pages they are viewing, what countries they come from and how they are referred to the site. Pingxi happens to be one of the rainiest areas in Taiwan but it hadn’t rained for months when I visited. I must go back. Shifen Waterfall actually isn’t one of my favorite waterfalls but it absolutely dominates the traffic on my website. 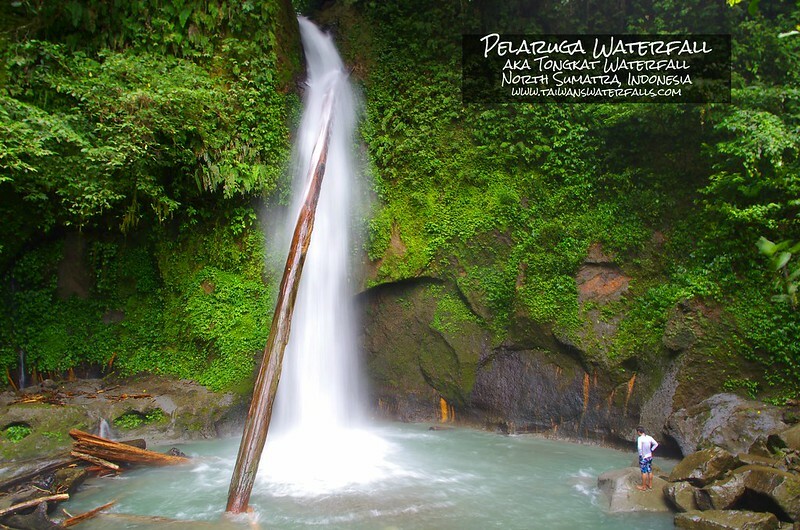 Sandiaoling Waterfall Trail and Shalawan Waterfall are two of my favorites and deservedly rank 2nd and 3rd. Shalawan Waterfall is unusual because when I published the guide there was almost no English information of it and I visited it for the first time this year. Typically it takes a year or two for a page to become popular enough to rank highly but Shalawan immediately shot to #3 and I hear constant comments from expats about how much they love it. There were some pages that were viewed less last year but for the most part page views went up for every waterfall. In addition to increased traffic on existing pages I also added over 60 pages of waterfalls, hikes, temples (Bali) and other sights to the guide. 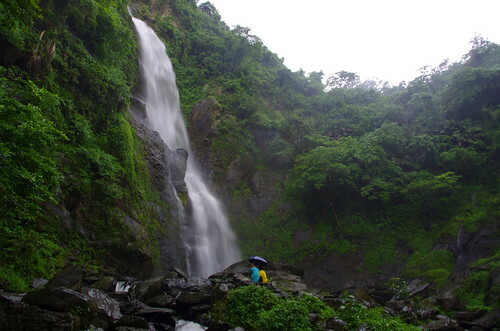 Shalawan Waterfall (pictured above), Qufengbi Trail, Beidawushan, Haishen Waterfall, Laomei Reef, Qingshan Waterfall, Alibang Waterfall and Dadi Gorge all were viewed over 200 times despite being published this year. Maybe a couple of these will be in the top 10 next year. I don’t think anyone is surprised that Taiwan ISP addresses dominate my readers. It will be interesting to see how this changes during the next 2-3 years as I add more and more content from outside of Taiwan. Another expected stat was that the largest native speaking English countries ranked in the top 10 in addition to Singapore and Hong Kong which speak multiple languages at near native levels. Indonesia made the largest year to year increase due to my trip to Bali in June and it should climb even higher if I am able to add content from Sumatra and Lombok this year. One country notably absent is Japan since they have a large population and are one of Taiwan’s closest neighbors. I am not sure if I will be able to travel to Japan this year or not but I want to take many trips to Japan during the next 5 years. It is interesting that I get fewer readers from Taiwan on my blog versus my waterfall guide but this makes sense with how I use social media. Most of the time I post my waterfall guide updates to the Taiwan’s Waterfalls FB page (followers are mostly in Taiwan) and I usually post my latest blogs to my personal FB page (a lot of friends and family from back home). 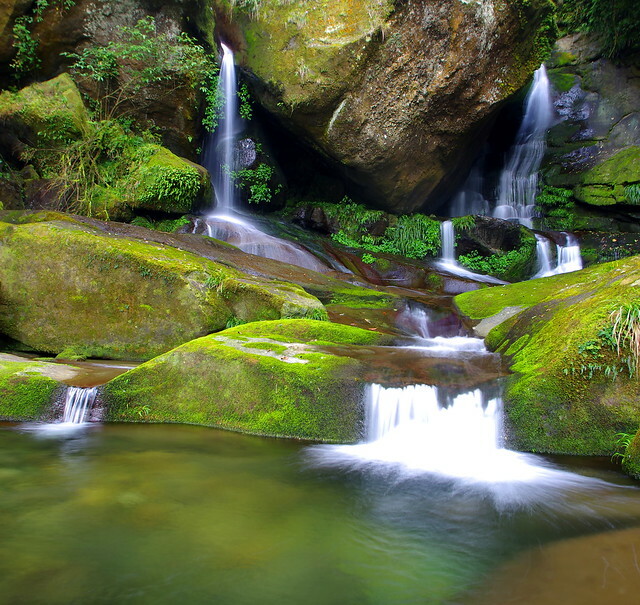 Additionally the waterfall guide is more useful to those living in Taiwan. Referrals are essential for any blog to succeed and I have done very little to promote the blog myself. I finally became active on social media (non-personal accounts) this year but I have barely scratched the surface. The Taiwan’s Waterfalls FB page has grown from 120 followers to 640 followers this year since I have been posting regular guide updates in addition to linking to various waterfall sites from around the world. Other than regularly (less so every year) posting on forumosa.com and occasionally commenting on other blogs, I have done very little social media promotion. More important than producing your own social media following is getting your site linked in other blogs and in their social media feeds. Most of my referrals aside from FB (and many on FB also) and forumosa are from other people mentioning my blog. Foodie Baker wrote a blog about Wulai years ago and their referrals keep increasing every year so their blog must be doing really well. Michael Turton is a very popular (and sometimes polarizing) expat blogger in Taiwan with interests in politics, biking, history and travel. Steven Crook is the Bradt Travel Guide Taiwan writer and does some blogging on two sites. 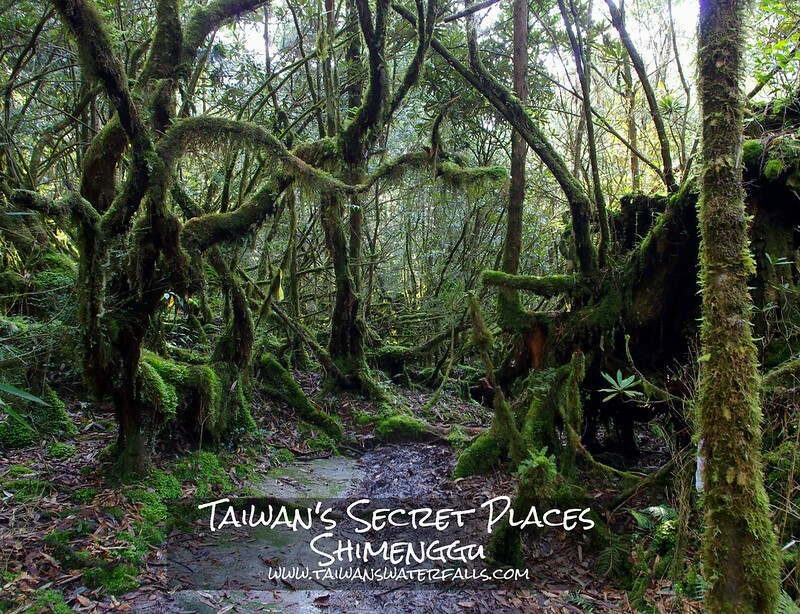 Taiwan Explorer has a popular FB page with a lot of discussion, writes a blog and publishes a blogroll at mytaiwanblogs.blogspot.tw. Camping in Taiwan is my go to resource for finding a campsite on my weekend excursions. Green Laundry, Nomad Notions and Taiwanvore have in the past linked to my blog and their content still brings a few visitors. My next social media avenue is pinterest.com. This seems like an excellent outlet for photography blogs. For the last couple of months I have been creating boards and pinning blogs that I like. The plan is to create boards that people want to visit and build up a following (currently 140 followers) before adding a lot of my own content to the boards. 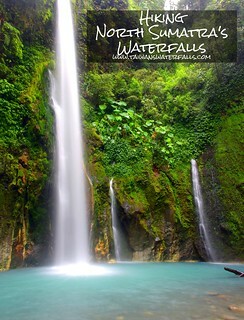 I have enjoyed creating my pinterest board Travel Blogs – The World’s Waterfalls. Another big area of improvement is including properly sized images in blogs for different types of social media and to start putting titles on the photos. Every blogger should be doing this (an example). What types of social media do you think I should start using to promote my blog? I plan on using Instagram this year. I despise Twitter although many say that it is essential for bloggers. Tumblr seems interesting but I didn’t really like using it. Does anybody actually use Google+? Is there any reason to post stuff on there? I have no understanding of Reddit but somebody posted my guide on there last week and within a couple of days I had 200-300 hits from that site. Snapchat sounds like my own little personal hell. I won’t be using that. There is definitely a lot of untapped social media potential but ‘social’ isn’t exactly something that I do well. The opposite of referrals (clicks) is also true in my blogs as well. I have frequently included links to other blogs when writing blogs but this is an area that I want to improve on next year. One specific area is to include links to 2-3 blogs for each of the pages in my waterfall guide so my readers can access more information about a place. I think my information is good but it isn’t always perfect nor does it tell the entire story about a place. Clicks from my blogs fall into 3 main areas. 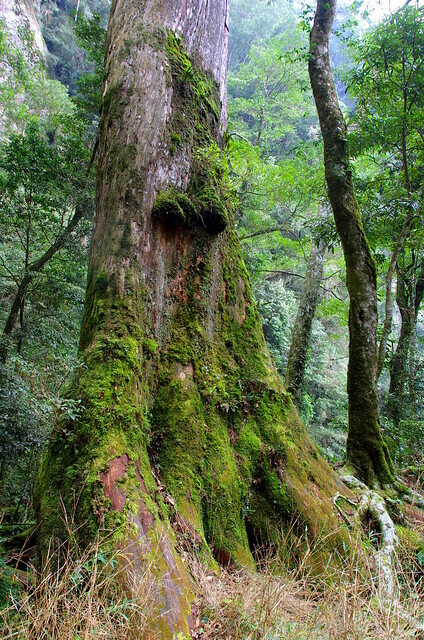 The first area is resource sites such as China Post (newspaper), Guide to Taipei, various National Forest Recreation Area website and the Central Weather Bureau. The second area is a group of bloggers that have remained on my links pages and still get some traffic. This page needs to be updated to include more relevant links for travelers in Taiwan. I have linked to 3 different websites written by Richard Saunders (my favorite article that he has written) in addition to numerous China Post articles written by him (and a few other authors). This shouldn’t be a surprise since he has been (almost) everywhere that I want to go. He has a new must have book coming out soon for those traveling through Taiwan. The last area is random individual bloggers and this is where I want to improve my linking the most next year. In 2015 I started featuring relatively unknown bloggers that are doing great work in my series Great Bloggers. So far I have done a series on Asia, Australia/NZ and Waterfalls with 10 bloggers featured in each article. 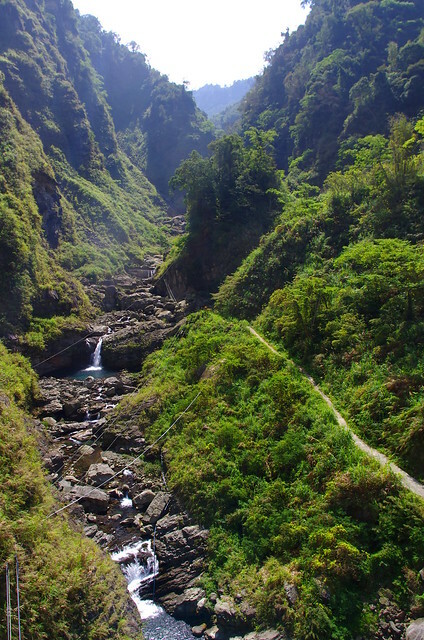 My next article is 10 waterfalls to visit in Taiwan for 2016 and it wasn’t easy finding 10 active bloggers that have great blogs/photos of waterfalls that I haven’t been to. 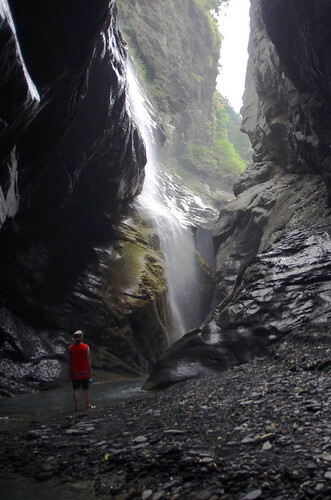 These two waterfalls rank highly because of their proximity to Taipei and many go there. They are relatively boring waterfalls though so I won’t post photos of them. Most likely they will fall out of the top 10 statistically next year. 9. 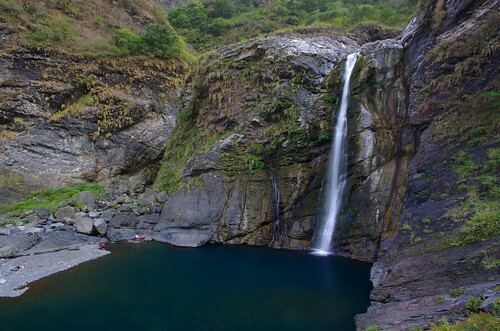 Liangshan Waterfall is a little more impressive than the previous two but its popularity is due to its nearby proximity to Kaohsiung and Pingtung. Do you have any thoughts on any of these statistics? Are they completely irrelevant? Is anything surprising or interesting? I don’t use any fancy Google Analytics or even have a hosted blog (yet). I am currently working on improvements and getting it hosted but I have a real job that I earn real money at so that is (usually) prioritized. I have many things to improve but do you find anything particularly frustrating about either site? 11. 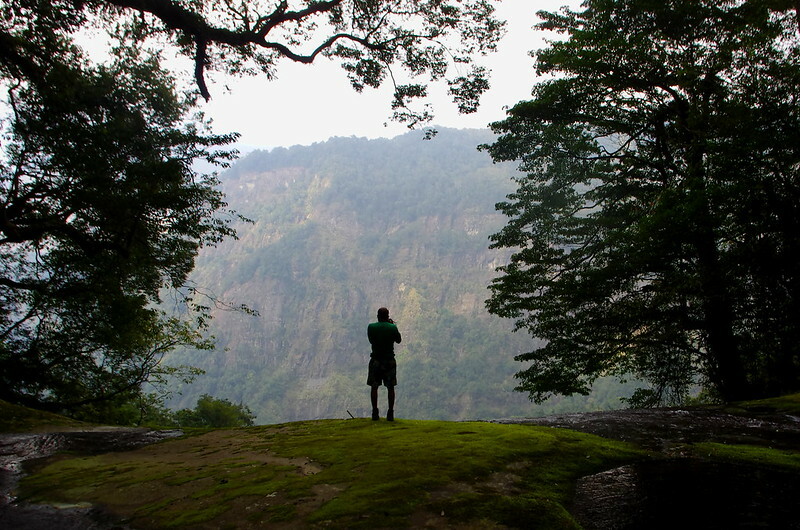 Guifu Canyon is one of the most unusual places that I have visited in Taiwan. Absolutely incredible. Duona, waterfalls and the moon?